Heavy rains and flooding killed at least 30 people and destroyed thousands of homes in central and eastern Sudan. 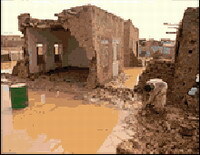 The strong rains, which began Sunday evening and continued Wednesday, destroyed at least 4,680 homes in Khartoum alone. Interior Minister Zubair Bashir Taha raised previous estimated death tolls to at least 30 dead on Wednesday. Hundreds of people were also injured or missing, Taha was also quoted as saying by the official Sudan News Agency. The seasonal rains are reaching record level and threaten to flood some neighborhoods of the capital, Khartoum, where the White and Blue Niles meet to form Africa's largest river. "Weather forecasts predict that we can still expect heavy rains and that the average level of the Nile will surpass that of the 1946 and 1988," Taha said, referring to two years of record floods. Three areas east of downtown Khartoum were surrounded by flood waters on Tuesday. Hundreds of people were stranded in the flooding Tuesday in Um Dhawban, located about 30 kilometers (19 miles) east of central Khartoum - their belongings swept away by the rising waters. The police and army have been deployed to the area, the minister said. "Most citizens have deserted the area that is now totally inundated," the minister was quoted as saying by SUNA. In eastern Sudan, the rising river Gash, which flows into the country from the Ethiopian plateau, had also created flash floods in the Kassala area, leaving hundreds of families stranded. Several United Nations agencies and aid groups said they sent food and other items, including plastic sheeting, blankets, cooking sets and mosquito nets to thousands of families in the affected areas.